VehicleNotifier Pro is a tweak for iOS that will forward all *new* iOS notifications to your car screen. The tweak extends the functionality of VehicleNotifier Lite version and the tweaks are not compatible. 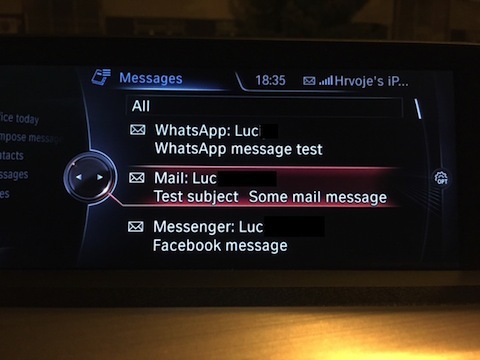 The tweak will work if (*and only if*) your car supports displaying iMessages/SMS on the screen via bluetooth connection (and it works properly). This tweak will override notification problems that currently some vehicle manufacturers have with iOS devices. If you're not sure will it work, please install VehicleNotifier Lite. It has some limitations compared to the Pro versions. Please don't expect this tweak to fix your car <--> bluetooth connection problems. The tweak doesn't support replying to incoming notifications. 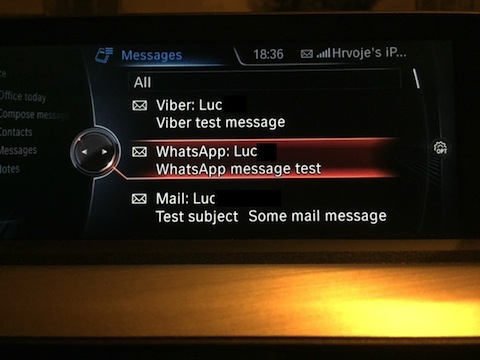 Please note that the tweak has been developed for (and tested only on) BMW NBT iDrive. Most likely it will also work on MINI, Mercedes Benz, Ford, Audi (...) vehicles that support displaying iMessages on the screen. Supports Mail, WhatsApp, Viber, Messenger, Facebook, eBay, Skype (...) notifications. A bugfix for older iOS versions.